“Fitness jewelry for Fitness lover, the latest trend by iShake. You’ll love the vibrant silver tone chain and durable double-sided pendant. We are providing affordable fashion. This is crafted from quality stainless steel this piece is long lasting non-irritating even to sensitive skin. Fitness jewelry for Fitness lover, the latest trend by iShake. 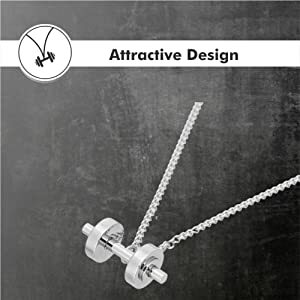 This double plated dumbbell necklace is durable and has an excellent finish, beautifully designed for fitness freaks. This necklace goes very elegantly with your casual attire. This beautiful dumbbell necklace is nickel and lead-free. The quality material ensures durable & sturdy usage. 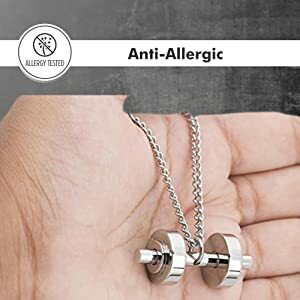 The necklace is anti-allergic and safe for all type of skin. 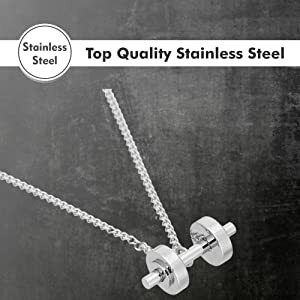 Made with quality stainless steel material that ensures rust free long term usage of the necklace. It does not wear out with time even when used daily.